About a month ago I signed up to get notices from King Arthur Flour, as I had found some interesting products and recipes the few times I’d poked around there. 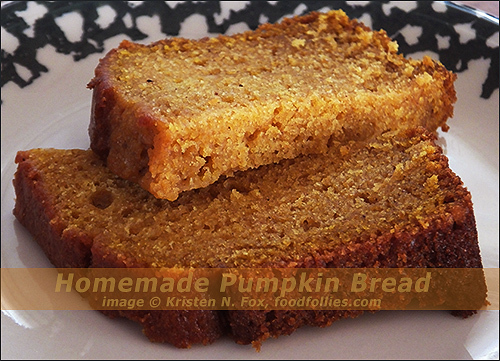 A few days ago, they shared their Easy Pumpkin Bread recipe. Since it was almost Halloween, and we had a can of pumpkin in the pantry, I was good to go! 1) Preheat the oven to 350°F. Lightly grease two 8 1/2″ x 4 1/2″ loaf pans (if you’re making the plain version of the bread); two 9″ x 5″ loaf pans (if you’re adding chocolate chips and nuts); or one of each, if you’re making one plain loaf, and one loaf with chips and nuts. 3) Add the flour, baking powder, baking soda, salt, nutmeg, and vanilla, stirring to combine. 4) Mix in the chips and nuts, if you’re using them. To make one loaf with chips/nuts, one loaf without, divide the batter in half. Leave one half plain, and add 3/4 cup chips and 1/2 cup nuts to the other half. 5) Spoon the batter into the prepared pans. Sprinkle the tops of the loaves with coarse sparkling sugar, if desired. 6) Bake the bread for 60 to 80 minutes, or until a cake tester or toothpick inserted in the center of the loaf comes out clean; and that same tester inserted about 1/2″ into the top of the loaf doesn’t encounter any totally unbaked batter. 7) Remove the bread from the oven, and cool it on a rack. When it’s completely cool, wrap it well in plastic wrap, and store it overnight before serving.